Come February and March, we all get a little antsy to get out and dig in the dirt. Geraniums can be wintered over to give another season of bloom and more plants for the border. They can also keep you busy so you don’t spend too much time with those catalogs. You can winter-over your geraniums in the garage or keep them in your bedroom window all winter long. 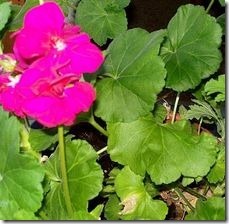 Since geraniums are actually perennials, plants may be kept inside and will continue to grow. They should have several sturdy new shoots by the time the seed catalogs start arriving. To start plants from cuttings, snip the ends of branches and strip all but the end leaves off. You should have two or three nodules (where you pulled off leaves) on your stems. Dust the ends of the stems with rooting hormone powder and plant them in peat pots filled with a sterile, light planting medium. Keep the soil moist but not wet to avoid mildew. After about a week to get a good start (developing roots is hard work! ), move your plants to a sunny window until after the last frost. I put my geraniums in an east or west window. Choose healthy plants with lots of branches to keep over the winter. Pot them up. Then bring them in and treat them like houseplants. Fertilize lightly in late winter and make sure they get plenty of light. Water when the surface of the soil gets dry to the touch. Don’t over water. Pinch branches back to encourage bushiness and to keep them from getting leggy. Pinched branches can be trimmed and planted any time. Alternately, store your potted geraniums in a cool (not freezing! ), dark place until late winter. Trim each branch back to a nodule so they will branch again when you bring them inside in late winter. Geraniums can also be started from seed but you should only plant seeds from reliable sources as many varieties do not grow true-to-type. If you do grow from seed, start 12 to 16 weeks before the last frost, cover the small seeds lightly with soil and move outside only after the last frost. Most gardening books recommend cold storage for geraniums over the winter. I never had any luck with this and found that an oversized dishpan-full of geraniums in the window provided colorful blooms and a guarantee that I’d have starter stock in the spring. Start as many sturdy shoots as you have. Pinch back once to create another branch in your new plant. Use rooting hormone sparingly and very carefully–roots grow from the outside edge of the end of the branch. The powder is toxic to fish (use with care around ponds and aquariums) and poisonous for humans. Be sure to strip all blooms when you pot up your geraniums in the fall–and when you start shoots in the spring. Blooms rob the plant of energy it needs to grow and set roots.